COURTESY OF | GREAT NORTHERN BICYCLE CO.
Finding fun in the heart of January can be difficult, especially coming off a holiday break in the area. Nevertheless, Fargo-Moorhead keeps the calendar fairly full these next few weeks, with events inside, outdoors and at all times. The homegrown horn band of F-M has the lounge at the Hotel Donaldson for its 8 p.m. show Thursday. Covering hits songs by the likes of Stevie Wonder, Earth, Wind & Fire, James Brown and the Blues Brothers, Post-Traumatic Funk Syndrome rocks and rolls with the sounds of the classic rock era. Guitar, bass, keyboard and drums are all there, including six horns and the soaring lead vocals of Sarah Morken. What better a way to warm up your winter night than PTFS at the HoDo? Moorhead’s visual art mainstay, the Rourke Art Museum, saw the end of one show last weekend, but ongoing exhibitions are still available for everyone’s eyes. “Art For Sacred Spaces,” “Transformations: The Art of Mask” and pieces from the museum’s permanent collection are available for viewing from 1-5 p.m. Friday or by special appointment. The Rourke has its new winter hours in place, and these and other information are accessible at therourke.org. Comedy’s Queen of Mean takes on the polite society of Fargo in Lisa Lampanelli’s tour stop at the Fargo Theatre. The Rolling Stone journalist-turned-comedienne has roasted the likes of Larry the Cable Guy, Pamela Anderson and Gene Simmons on Comedy Central and has shocked and awed audiences all over with her brand of insult comedy. For full coverage on Lampanelli’s visit to Fargo, check out staff writer Callie Bowen’s Q&A with the comic on page ##. 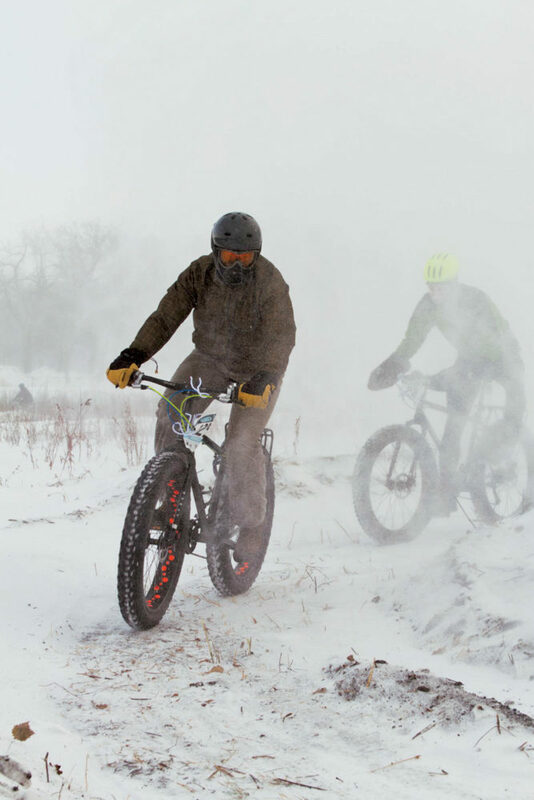 Extreme conditions take to the trail Sunday afternoon as the fifth annual B-B-BRRR Winter Classic Bike Race/Ride kicks off at 1:30 p.m. Across terrain ranging from paved paths to frozen prairie to the Red River itself, this ride is one to take just to say you did. In the middle of January, in North Dakota and through snow ice and cold, the B-B-BRRR race is extreme to the core, and sponsored by Great Northern Bicycle, Co. in downtown Fargo. Registration is available online at gncycles.com, and beware, bicyclists: Last year there was a ground blizzard on race day.